“That smells really good,” said my house-mate’s boyfriend the other evening while I stirred ratatouille in a small pan. He was leaving and she had escorted him to the door. “Are you using a recipe?” she asked, returning to the kitchen. “No,” I said, because I wasn’t following someone else’s instructions. But I was relying on my own, unwritten method, which I then decided to translate in a way that honors its à la carte-ness, paradoxically characterized by precision and randomness. Over the summer, I created several iterations with produce from farmers’ markets. It seems fitting to document the most recent results as a starting point for next year’s experiments. Alas, the harvest season is nearing an end. Ratatouille, the word, is fast and foreign as it fires from the tongue. But the dish, despite its exotic sound, isn’t particularly fancy, which is why I enjoy shopping for, cooking and eating it. Since ratatouille can accommodate many kinds of vegetables, it offers the chance to play around in the pan, making the preparation more like performing improv than reciting a script. I turn to ratatouille frequently because it’s both familiar and forgiving. My late Hungarian-born father used to make it, also intuitively, albeit differently (he used peppers, I don’t). And it’s pretty hard to ruin the dish unless the vegetables are “meh” or have languished in the refrigerator. To help with freshness and avoid possible waste, I try to find small zucchini, onions and eggplants so I can use the entire vegetable without having to wrap and store the excess. While this recipe is called “Ratatouille for Two”, don’t let that put you off if you’re single. It reheats well if you don’t eat it all at once. But, since it’s colorful comfort food, you might polish it off by yourself, whether you’re dining alone or not. Two = You + You. Who says you always have to share? 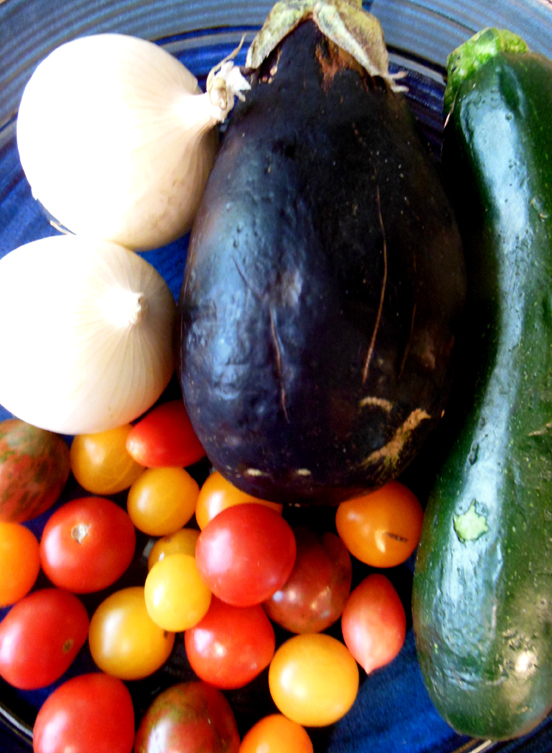 1 small purple eggplant, about the size of your hand, sliced into 1/4″ rounds or smaller, to match the zucchini. Can also use Chinese eggplant. Prep the vegetables and tomatoes first, keeping them separate from each other. Ideally, no single ingredient dominates the dish. If you end up with far more eggplant than zucchini (or vice versa), put the extra aside or save it for another batch. Heat a skillet over low-medium heat with a few capfuls of olive oil, or enough to coat the pan. Add onions and stir until they soften, maybe 3-5 minutes. Sprinkle some of the sweet smoked Spanish paprika (with apologies to my ancestry, NOT Hungarian paprika!) into the pan so that it blends with the oil and the onions, turning them somewhat orange. Better to be cautious with the paprika at first; it should add flavor and a smoky fragrance without overpowering the vegetables. Add the eggplant, making sure it gets coated with the olive oil (throw in a few more capfuls if needed). After a few minutes, when the eggplant starts to soften and brown, add the zucchini and stir. Finally, mix in the cherry tomatoes, reserved juice and seeds. Stir occasionally to prevent the vegetables from sticking to the pan, although a little browning is OK, especially of the tomato skins. Add salt to taste (the grinder allows better control) and more paprika if needed. Lower the heat, cover and simmer a few minutes. The ratatouille is done when the eggplant and zucchini are equally soft, not mushy, and the tomato skins have wrinkled and collapsed, releasing the juice. Serving suggestion: for a main course or hearty appetizer, serve over thin slices of cooked polenta and top with crumbled goat cheese. Can also be a side dish. Variations and substitutions: Go “monochrome” (use a green Thai eggplant, zucchini, green tomatoes and green peppers). Or white and yellow: white eggplant, yellow squash, yellow tomatoes, yellow peppers. I prefer peppers raw, which is why I don’t use them in ratatouille. You can also use regular tomatoes, although these take a bit more time to chop into evenly sized pieces and color selection is limited. Love garlic? Add a clove or three along with the onion. Sliced is better than minced. « Can a Mammogram be “Fun”? Hi ilona, No, not so far…if you know how share with me as I am going for one this month……hahahaha. Thanks for visiting! Yes, I had her book in mind…will send it along.